Concept: The ever-popular wedding season is upon us and now is the perfect time to become the new owner of this elegant ready-made wedding business – StylishWeddingBoutique.com! 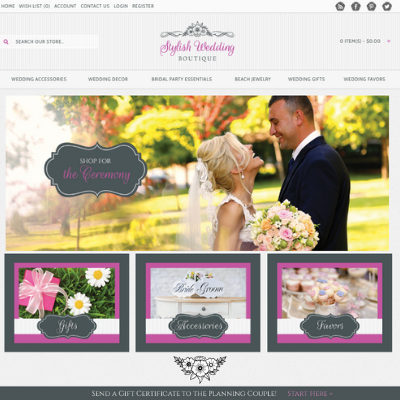 Here the happy couple will find everything they need to create their own stylish wedding. Whether they are planning a destination to say "I do" with their toes in the sand or a more traditional wedding they will want to shop here where they will find beautiful wedding accessories, stylish wedding decor, essentials for their bridal party, magical beach-inspired jewelry, memorable wedding gifts, and must-have wedding favors for their guests to enjoy! When you work with Pure-Ecommerce you will not be required to hold any product inventory as all the products featured on this site are drop shipped from the vendors to your customers. Our team will load the first 300 products, as well as, establish the initial vendor relationships to get you started. As the owner of this 100% responsive design website, you will love the outstanding features including beautiful rotating images on the homepage with marketing messages to grab your customers’ attention. You will also be able to connect with people planning their upcoming nuptials through the connected social media pages, newsletter, and blog where you can share helpful planning tips, the latest wedding industry news and other inspirations to help them plan their own special stylish wedding! New to ecommerce and not sure where to get started? Then let us help you as this website includes access to our exclusive eLearning Library which houses our comprehensive 10-step instructional program to help you set up, learn to run and market your online business. You will also receive 40 hours of consulting to answer any questions you may have as you work through our process. The U.S. wedding industry brings in $72 billion in revenue, with the average wedding costing $32,329. 83% of wedding planning is done online – 42% on mobile or tablet and 41% on desktop according to WeddingWire.com. The destination wedding market accounts for $16 billion in annual spending. 24 percent of marriages are destination weddings. Two of the top wedding destinations include Hawaii and the U.S. Virgin Islands.